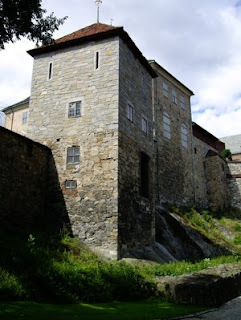 Akershus fortress and castle has defended the citizens of Oslo for over 700 years. Early in the 14th Century the last Norwegian kings started to build a magnificent military stronghold on a cliff overlooking the mouth of the Lo river and the inner part of the Oslo fjord. At that point the city was located south of the fortress, where you still find a part of the city called Gamlebyen (The Old City). 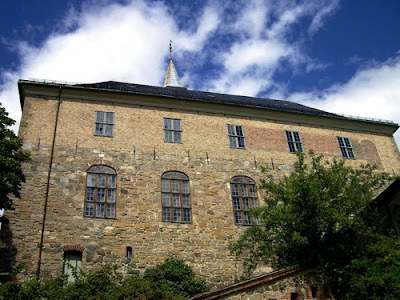 Akershus is linked to the development of Oslo as the the biggest city and its role as capital of Norway. 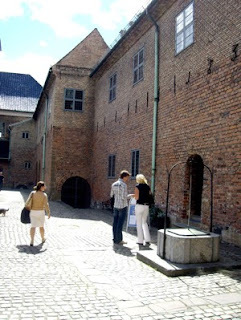 The complex as it stands today goes back to the mid 1300, and it has buildings dating back to late medieval times, from the renaissance and baroque, and reconstructed parts from the Nationalist Revival period in the late 19th and early 20th century, leading up to the break up of the union between Norway and Sweden in 1905. 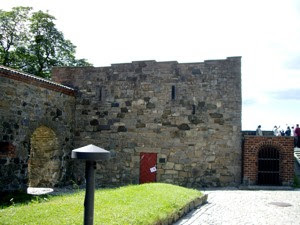 King Håkon V started the building of the fortress as far back as 1290. From this period you find this small and insignificant tower, Knutstårnet. It is one of the few buildings left from the first time. Its name dates back to the early 16th century. Knut Alvsson was a powerful noble man during turbulent times in the Norwegian history. 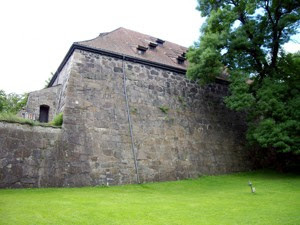 He was also in charge of the fortress from 1497 to 1498. After being forced abroad by the Danish king, he returned in the year 1500 as a leader of an army of peasants. Sadly he was caught and executed in 1502, and his corps was allowed to rot inside this tower for twelve years to 1514, when he finally was released for burial. So Knutstårnet got his name from Knut Alvsson. The fortress was seriously affected by the wars in the first half of the 16th century. In 1527 much of the fortress was destroyed by fire ignited by a lightning. Much of the remaining parts of fortress was destroyed the wars that raged during this period. It was the colourful renaissance king Christian IV that started the work to build up what was left in ruins. He tore down what was left of the medieval towers and built two new. Blåtårnet (The Blue Tower) and Romerikstårnet, named after the area Romerike north-east of Oslo. It was peasants from just this area that were enrolled as labourers to complete one of the wings of the present castle. Today you can enjoy the magnificent rooms from this period with furniture daring back to the renaissance and baroque era. The fortress was extended and reinforced during the next two centuries. The impressive bastions were built then by experts that were hired in to create a state of the art military complex. In spite of this fortification, Akershus fortress gradually lost its military significance as the Kingdoms of Denmark-Norway (1319-1814) and Sweden-Norway (1814-1905) entered more peaceful times. The last buildings that were to be reconstructed were to celebrate history at the dawn of the age of Norwegian National Patriotism. The decades leading up to the turn of the 20 th century was the dawn of the new Norwegian state. As the union between Sweden and Norway gradually broke down, the national consciousness of the Norwegian increased. In this period the importance of monuments left from the medieval period when Norway was an independent state increased. 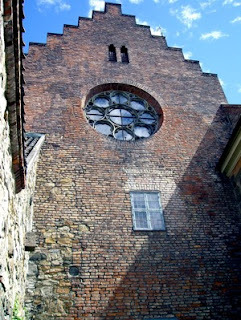 The restoration works on the Nidaros cathedral where the shrine of King Olav II, Norway's eternal king started in 1869, and important restoration works were also started at Akershus castle. The Royal mausoleum has its entrance from the fortress courtyard, but the building is relatively new, as it was finished in 1947. Today it house the graves of the Norwegian kings and queens. They are: King Haakon VII (1872-1957), married to Princess Maud of Wales (1869-1938), daughter of King Edward VII of England and Queen Alexandra. Haakon VII or Prince Carl of Denmark was elected the first king of the independent Norwegian monarchy in 1905. Here you also find the grave of King King Olav V (1903-1991) married to Crownprincess Märtha (1901-1954) of Sweden. Jomfrutårnet (the Virgins Tower - image) is from the oldest part of the fortress. In 1567, during the Seven Years War, a Swedish horseman was killed by the Guards as he harrased them. From that time it is claimed that you can hear the sound of a horse riding by the entrance. You were doomed if you saw the Horse of Death, you would die before the year was out. The dark passage led from the Gates into the heart of the fortress. 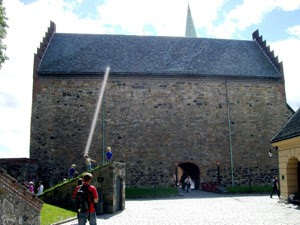 In 1550 a part of the passage fell down, and the commander at Akershus, Peder Hansen Litle decided to inspect the damage. As he walked down the passage with a small lamp, the rest of the soldiers refused to follow him. Here he met Malcanisten, a large black beast of a dog, with glowing eyes and a chain around his neck. Peder Hansen Little threw the lamp at the beast and fled., and he died the coming year having not recovered from the encounter. 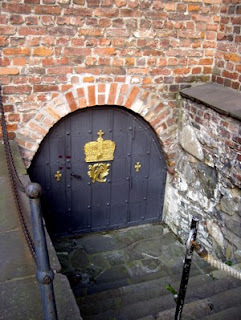 In 1370 the young Queen Margrethe lived at the fortress. She wrote a famous letter to her husband Olav VI of Norway, complaining to him that even she starved as the rest of the royal household. Mantelgeisten wandered around here for 500 years. She was said to be one of Queen Margrethes maids that starved to death that year. She used to glid out from a dark corner, faceless with a large cloak, scaring the spectators before she slowly vanished into thin air. She did not like books, however, as when the National Library moved into the Margrethehallen in 1811, she was never seen again. So whether you believe in ghosts or not, or just want to see what is left from 700 years history, there are plenty reasons to visit this wonderful National monument. So come - to Enjoy! !